Originally built as a 64' motor yacht, this classic 72' Hatteras cockpit motor yacht SOMETHIN FUN had a large cockpit added for great water access, ease of line handling and boarding from floating docks. This yacht has walk around side decks and the big aft deck that is always popular. The interior wood has never been painted, it is the original since built. All of the interior wood has been done in a semi gloss finish showing the rich texture and grain of the original Hatteras interior, but with updated headliners and lighting. The yacht has been used as a live aboard for many years and would make a great waterfront condo for the next owner. United Yacht Sales New Jersey would love to guide you through a personal showing of this 72' Hatteras Cockpit Motor Yacht 1980. 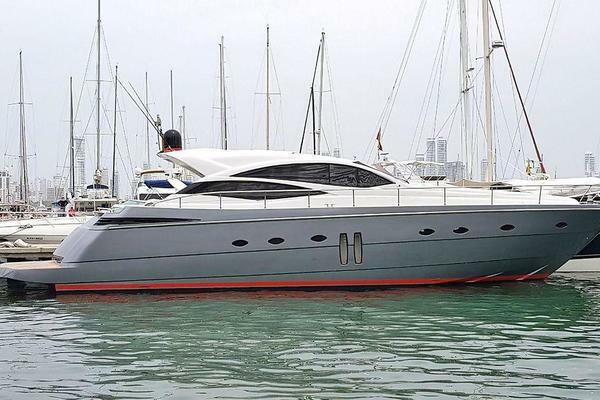 This yacht for sale is located in Fort Lauderdale, Florida and priced at $199,000. For a showing please contact us by filling out the form on this page and we will get back to you shortly! The pilothouse is separated from the galley and the rest of the main deck. The interior woodwork is the original wood but with a semi-gloss finish with the flooring of high gloss teak planking. Navigation equipment has reached an age for updating, but a new VHF has just been installed. The pilothouse has doors to both port and starboard to make this a great helm station for docking, with easy access to both sides with full walk around side decks. Over the wide bench seat is an etched glass chart for a piece of nautical art.The galley is just aft of the pilothouse with white mica panels with varnished teak trim. Updated Corian style counter tops and appliances including Thermador 4 burner ceramic counter top stove with fiddle rails to hold pans while underway, Thermador convection - micro-thermal oven, Kenmore elite full size dish washer, stainless GE side by side full size freezer refrigerator, and stainless sink with smaller vegetable sink with Insinkerator.The main salon has the same semi-gloss finished teak as the rest of the yacht. The large opening windows have wooden blinds to compliment the rest of the interior. Forward is an entertainment center that has been made into a large storage cabinet by updating to a flat screen TV. There is plenty of room for the couch to starboard and two occasional chairs to port, and none of this furniture is built in so it can be redecorated to the new owners taste easily. Aft is a bar area and more storage.The back deck is large, taking advantage of the full 18' beam of the yacht. This area is air conditioned and has glass windows aft. For fresh air the two wing doors can be opened and the side windows are sliding. The floor is high gloss varnished teak for a richer look than fiberglass. The deck is large enough for a dining table with four chairs plus room for a loveseat, chairs or whatever the new owner may want here. A wet bar with refrigerator makes entertaining here easy. There are full sun shade curtains to keep out the tropical sun when needed.Access to the master and guest cabins is from a curving staircase at the front of the salon. Like the rest of the interior, none of the wood paneling has been painted over so this yacht will appeal to the Hatteras purist. The master is mid ship full beam with a centerline queen size berth, multiple closets and a full ensuite head with tub and shower.There is a starboard guest cabin with two twin berths for the most versatility and the third stateroom is more of an office. There are two bunk berths that grandchildren love, but to one side is a full desk with storage. The head for these cabins can be entered from the hallway or the starboard cabin directly.Forward are the crew quarters with both a double berth and a second single berth and ensuite head with stall shower. The design of the yacht is full walk around covered side decks for ease of docking. Plus, since the side decks are covered the side windows do not need to have the curtains closed all the time for shade. There are full exterior sun shades for the windows if needed. Forward is a bench seat and two storage boxes on deck. Aft is the large cockpit with transom door to the swim platform and engine room access. Like many Hatteras motor yachts the shore cords can be plugged into the boat in different places, this yacht has a Glendening cable master in the cockpit in addition to the forward inlets. Windlass is by Plath and there is a Fortress aluminum anchor. The engine room can be accessed by a door on the port side walk around plus from another door in the cockpit. The engines are the tried and true Detroit Diesel 12-71s rated at 650 hp each in a full stand-up full beam engine room. Current meter readings as of April 1st, 2018 are port main 3635 starboard main 4617 and the Kilopak generator has 3575 hours. Air conditioning system has seven compressors with air handlers throughout the boat. There are three battery chargers. The Naiad stabilizers have not been used in years and need servicing. Since the boat was used as a floating home this equipment has little use in recent years. The flybridge has large open areas for many guests with a wrap around bench seat to the aft. Behind the hem is a wet bar with storage below. Aft of the bench there are two davits that have not been used and the electric motors will need replacement to use with a light dinghy. On May 22, 2018 an engine evaluation was done on this boat by Joe Stafford of Stafford Diesel in Fort Lauderdale. Joe is an engine surveyor well known in South Florida who has done over 6,000 engine surveys. Since the boat has been used as a live aboard for many years with only occasional intracoastal cruises, it was decided to inspect the engines so a prospective buyer would feel more confident in making an offer and getting a good engine report. He reported that there is some corrosion in some of the cylinders but not to the extent that anything needs to be done at this time, if the boat is to be run at trawler speeds. Most owners of older Hatteras motor yachts run the boat at an efficient speed to add longevity to the engines and keep fuel consumption below 10 gallons per hour. The engines started quickly with little or no smoke and held proper temperatures on the sea trial. Prior to sea trial many new hoses were put on the engine with many new hose clamps and new raw water pump impellers. The evaluation makes suggestions for some maintenance work be done and that work will be in progress right away. The engine surveyor reported that the engine were in good condition for a 1980 boat. The owner reports that the port engine was replaced around the year 2000 but no records of that are available. The starboard engine was rebuilt with new liners and rings and more in 2004 but those records have not been found. The Walter V drives were replaced in 2004 also. All the records had been kept at the owners business but were discarded when he retired.